14 Bedrooms, 7 full and 4 half baths, 6 car tandem garage, 15 gas fireplaces, grand open spaces, soaring ceilings, custom moldings throughout, spectacular 5.14 acres property with tennis court and heated in-ground pool surrounded by Travertine terraces, and so much more. Click here to see the MLS listing and photos for this home. Additional information not found on the MLS can be found below. In 1997, the home’s present owners embarked on a five-year transformation of the estate that has become an architectural tour de force…comprised of an elaborate confluence of unsurpassed detailing, lavish styling and artistic influences from all over the world. Inside, no detail has been spared in its intricate craftsmanship, where Venetian plaster walls and delicate gold leaf friezes are set above hand-carved moldings and trims, and where inlaid mosaic marble floor designs, fluted Corinthian-style pillars, 24-karat bath fixtures and sinks, coffered, tray and domed ceilings serve as the backdrop for this grand home’s 30 rooms. 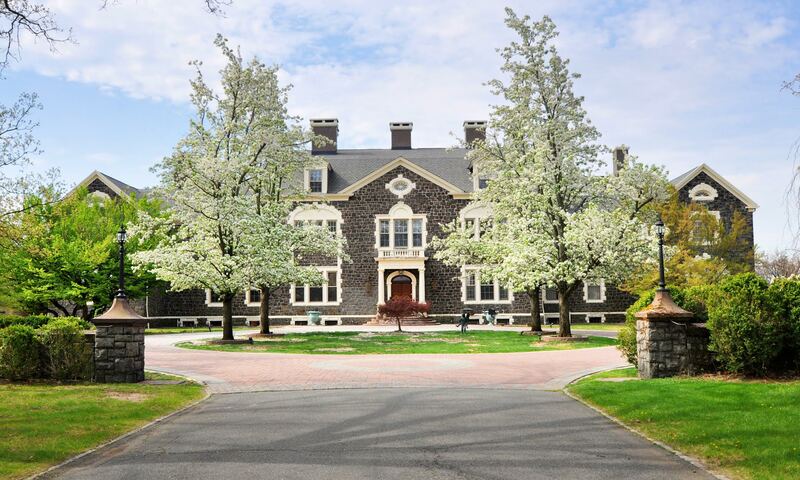 There are no fewer than 15 gas-log fireplaces, 14 bedrooms, two stunning chef’s kitchens and a summer kitchen, an elevator to three floors, a grand reception hall that harkens back to the days of Versailles, and so much more. Outside, the property sits at the highest point in Livingston, from where one can see for miles, with lovely sunset views captured on a clear evening. The mansion awaits the visitor at the end of a long drive and a circular parking court, creating a commanding presence and promising no less, elegantly framed by sprawling lush lawns embellished with a Grecian-style fountain, tennis court, heated in-ground pool, squash court and garden house. A heated six-car tandem garage with storage loft is de rigueur for the automobile aficionado. 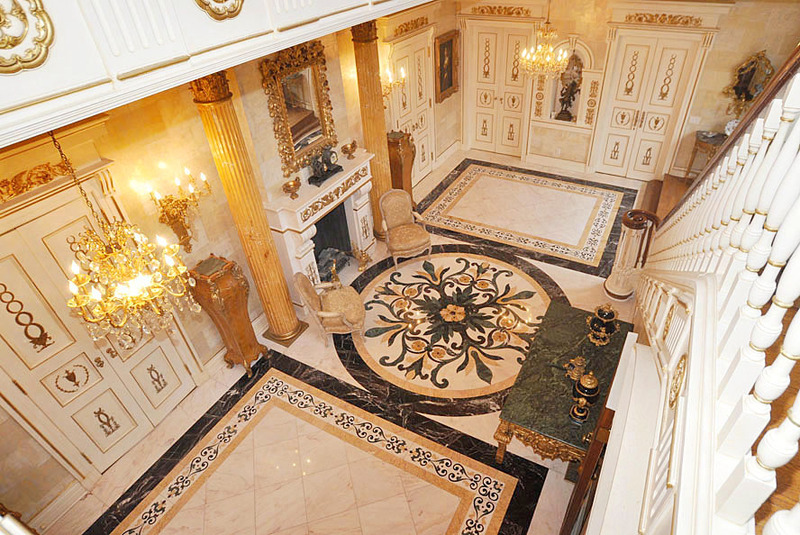 Splendor is the hallmark of an impressive two-story reception hall that showcases a grand marble fireplace flanked by decorative columns and ornate 18th-century French detailing designed to impress the most discerning of dignitaries. Anchored on herringbone hardwood floors and set beneath an ornate 13-foot high coffered ceiling with hand-carved detailing, the formal fireside living room graciously welcomes guests with a glass in hand from the marble-topped wet bar, while French doors usher them out to a covered palazzo and lush grounds dotted with lovely columned pergolas for the ultimate sunset cocktail hour. 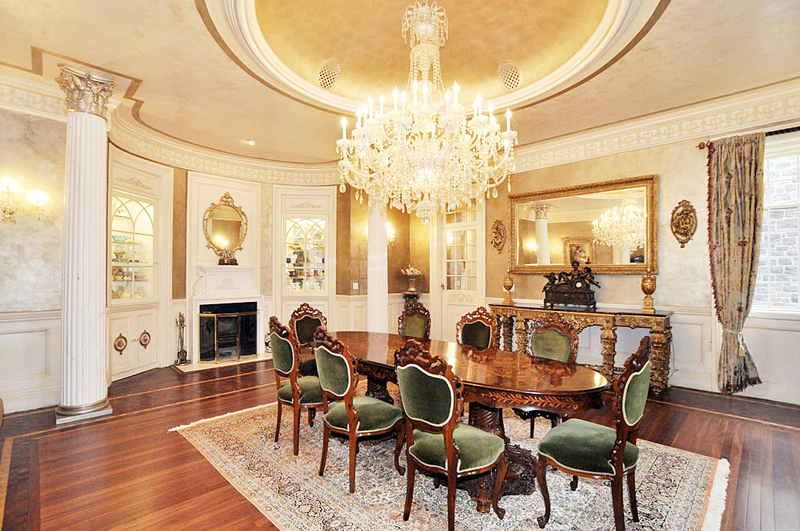 A banquet-scale formal dining room with fireplace sets the tone for a lavish experience under a dramatic domed ceiling, with mosaic pattern inlaid banded floor, handsome wainscoting and Venetian plaster walls. 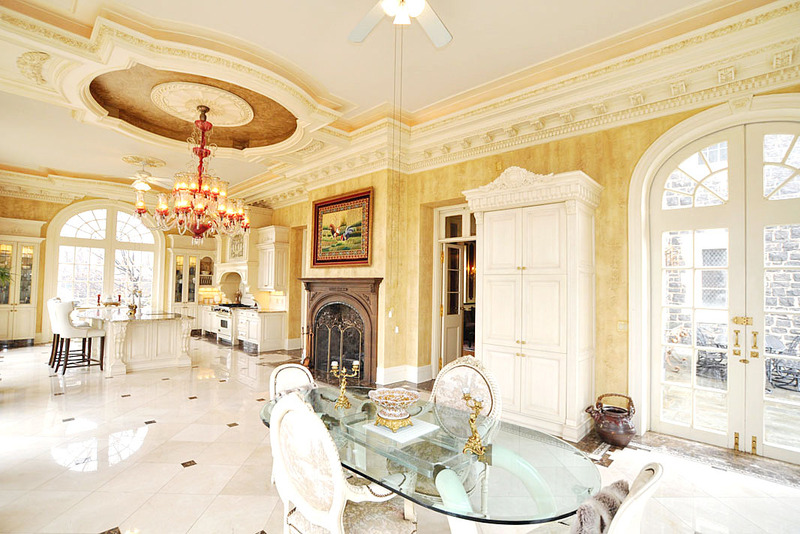 Palatial fluted columns and twin recessed curio display cabinets add distinction. 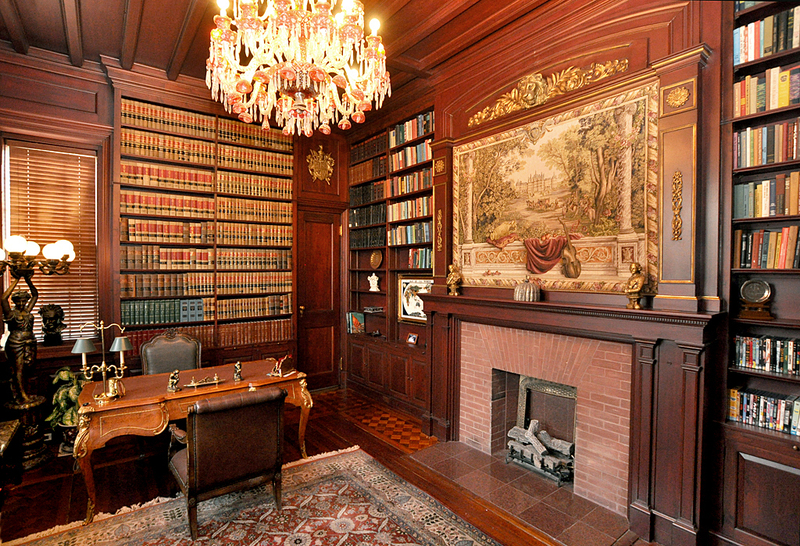 The residence would not be complete without a 13-foot high library, clad in mahogany from floor to coffered ceiling with built-in bookcases and window seats, and bathed in the warmth of a rustic gas focal fireplace that would make the likes of Professor Higgins proud! Upscale leisure living takes place in the beautifully appointed fireside media/family room where a state-of-the-art hidden screen and projector descend from the ceiling, enhanced with surround sound for the ultimate motion picture experience…the perfect respite for casual gatherings. The formal kitchen is bright, open and airy and privately reserved for the homeowner. Conveniently located off the family room, this is the discreet heartbeat of the home, featuring marble floors, ornate friezes and recessed cove ambient lighting. An open concept breakfast area with a gas fireplace is surrounded by six sets of Palladian-topped double doors that lead to a terrace with stone balustrade for extended al fresco dining. Idyllic views of the pool and fountain create a paradise for the senses. The butler’s kitchen, one of two magnificent chef’s kitchens, is located at the rear of the home, with elevator access to the lower level and second floors. Grand in scale and a designer showcase, the kitchen features a distinctive tray ceiling, granite countertops and marble floors, lacquered custom cabinetry, and professional-grade appliances (many of which come in two’s). 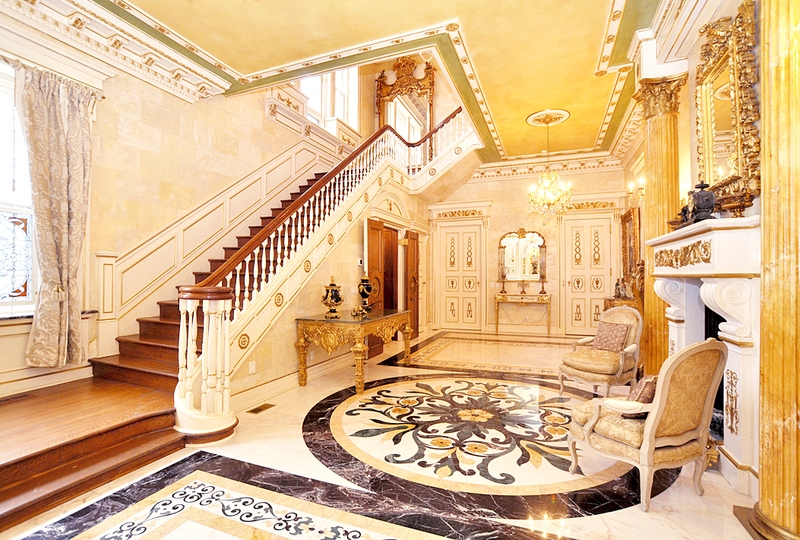 A massive seated center island with decorative corbels makes a dramatic statement. A sun-drenched solarium/formal breakfast room off the kitchen has marble floors, high ceilings, decorative columns and arched windows that take in breathtaking views of the expansive grounds– the perfect venue in which to serve the fortunate overnight guest with a morning meal. 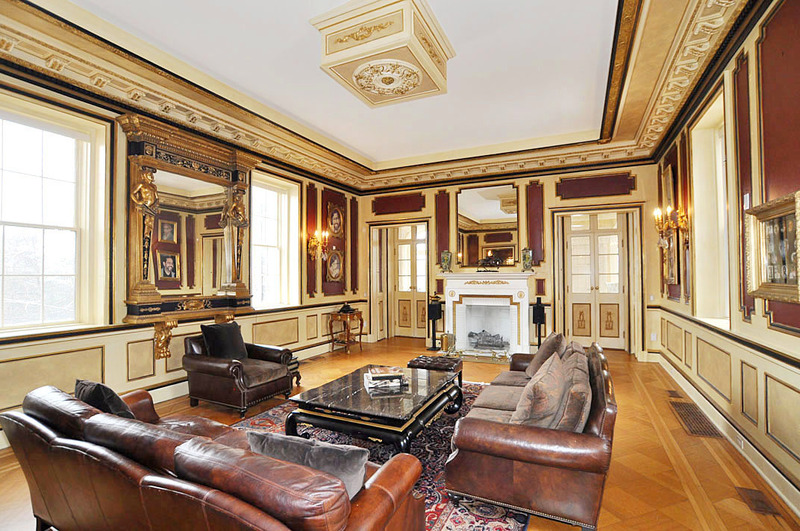 A sitting room or first-floor bedroom adorned with a gold-leaf dome ceiling is no less formal and eminently fit for royalty, while an exquisite full bath adjoins the sitting room and the solarium/breakfast room, creating a sumptuous first-floor guest wing, if desired. Buyer’s choice! 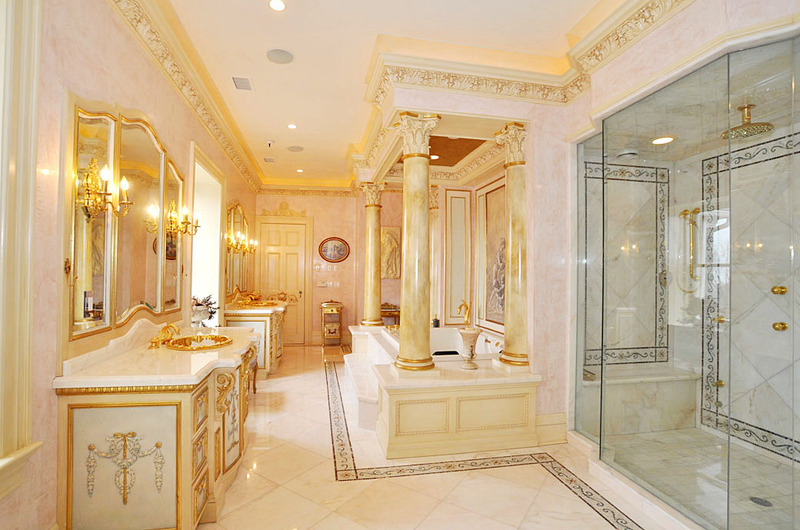 A 24-karat gold faucet, hand-carved gold-leaf moldings, a custom marble floor and floor-to-ceiling window adorn the first-floor powder room. A granite-floored breezeway with French doors along the way connects the main house to a heated six-car tandem garage with front and rear doors, plus a stairway to storage loft above. 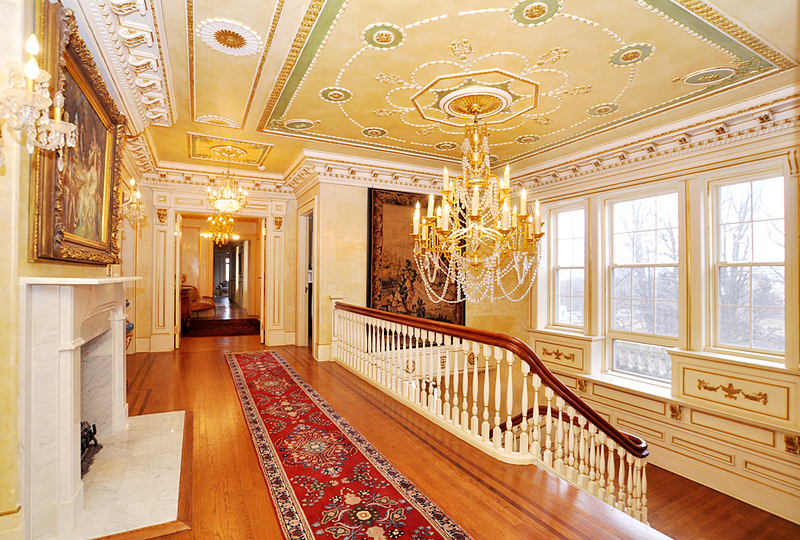 The grand staircase leads to an open second-floor gallery that overlooks the reception hall below, complete with marble fireplace, ribbon-banded hardwood floors, glazed Venetian plaster walls, two peer glass mirrors, a cozy sitting niche, 10-foot high ceilings and elevator. Four gracious ensuite bedrooms reside on this level, each with beautifully appointed baths that include 24-karat gold fixtures and sink inlays, marble surrounds, floors and vanities that are befitting of the rest of the home. A gathering room connects two of the ensuite bedrooms, privately set at the end of the hallway. Two additional bedrooms reside on this level, one of which is the perfect second-floor home office, with gas fireplace, built-ins and lofty views of the grounds. The other bedroom, adjacent to the master and featuring a fireplace and large walk-in closet, offers added versatility as a possible study, exercise room or nursery…delightfully subject to the personal preferences of the home buyer. And a spacious fully-equipped laundry center adds convenience on this level. 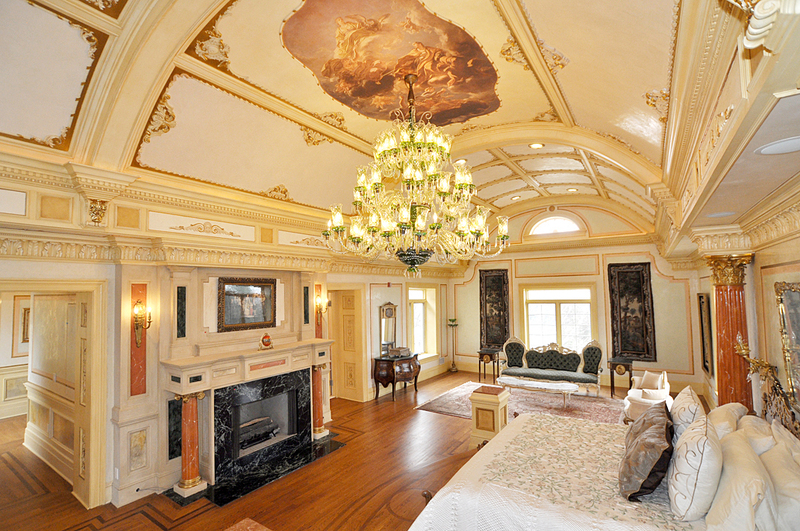 The piece de resistance is the private master quarters that occupy the entire west wing of the home, boasting four gas fireplaces. The bedroom enjoys panoramic front and back views from transomed windows and an ornate barrel ceiling with medallion that hovers above a raised custom platform for the bed. Venetian plaster walls with a gold-leaf wall mural, fluted columns, a media center, ribbon-banded floors and gas fireplace add romance and sophistication to the bedroom. The master dressing room comprises floor-to-ceiling built-ins, two massive marble-topped counters with dressing drawers framed by four columns. There is an additional closet, recessed lighting and the delectable warmth of yet another gas fireplace, while a large master sitting room offers an intimate fireside retreat after a long day. A luxurious master bath is also designed with 24-karat gold faucets and fixtures, radiant-heated marble floors, Venetian plaster walls and intricate double marble-topped vanities, a divine jetted soaking tub with two seats, marble walk-in steam shower with spray jets, hand-held and rain showerheads, a separate commode and a custom gas fireplace. 10-foot high ceilings, hardwood floors, detailed crown moldings, chair rails and/or wainscoting add grace and distinction to the seven additional bedrooms, each with door transoms that let the light spill in, walk-in closets and recessed lighting that creates a pleasing ambience. 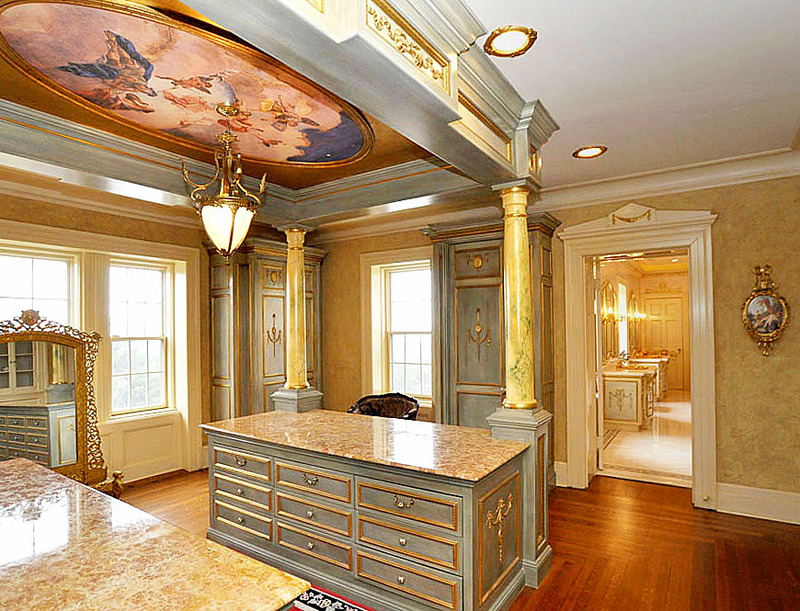 Two full hall baths include similar architectural features as the others; one has a delightful hand-painted Sleeping Beauty themed sink and matching commode. A summer kitchen on this level is an added bonus. A virtual home beneath a home, the expansive lower level provides extra leisure living, entertainment and recreational spaces, just as finely finished as the upper floors, with granite tile floor, coffered ceiling and arched doorways. The recreation room, game room, kitchen and a pub room with built-in custom seated bar offer the ultimate in unforgettable parties and events. Two powder rooms and plenty of storage add convenience. 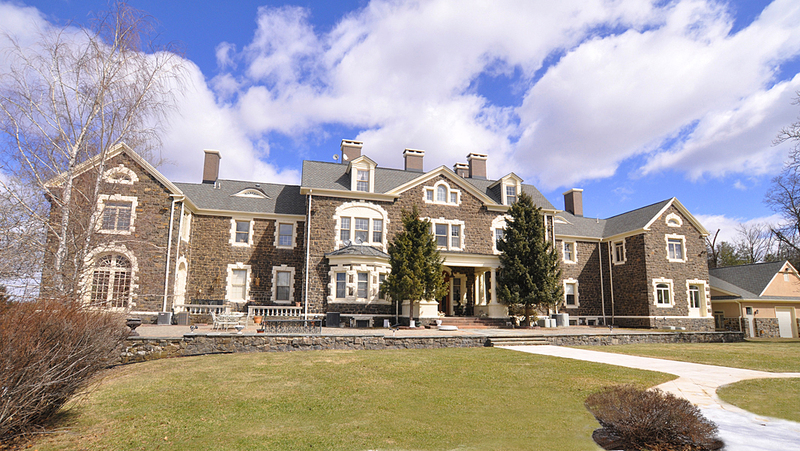 Beyond the extraordinary…With its elaborate European styling and eloquent history, its meticulous attention to detail, exquisite location and grounds, this impressive Windermere “chateau-like” estate is a rare New Jersey treasure.